Some things never change and one debate that has gone on forever is whether people should be allowed to openly carry a firearm in public. There are so many arguments both for and against this hotly contested topic that I can’t even keep count, let alone remember each and every one of them. One thing is for sure however; it’s a subject that’s guaranteed to get people’s blood to boil. Advocates of the idea insist that an armed public is a safe public. They feel that many tragedies such as the Columbine school shooting or the more recent Virginia Tech situation could have been avoided or at least the number of casualties minimized if others were armed and able to react quickly. On the other side of the coin there are those who feel that completely eliminating guns from our society would be a sure way to end the seemingly endless slew of shootings that we keep seeing on the nightly news. The question is which group is correct? You might be surprised to find out that only 6 states and the District of Columbia specifically prohibit the practice of “open carry” by law. 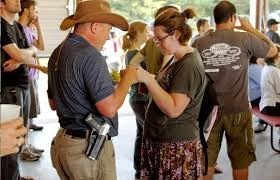 Some states allow citizens to be armed in public while the majority have no laws regarding this practice whatsoever. It’s also interesting to note that no court has ever ruled that the Constitution actually prohibits this practice. Some people argue that the 2nd Amendment allows for open carry while others interpret it as meaning that citizens have to right to possess guns only within their homes and not outside the boundaries of their own property. So what’s your take on the situation? Do more guns make us safer or place us in more jeopardy? It’s a hard question to answer but consider the way that most people drive their car in heavy traffic. If those are the same people that I can expect to see with a 9mm strapped on their side, I hope they treat it (and me) with more respect and courtesy than they do the public roads.